There is plenty to get to from the last 4 days, so lets dive in. 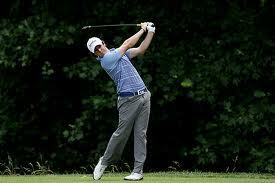 How about we start with Rory McIlroy hmm? This kid has the goods obviously. And don’t get it twisted, I’m not referring to his syrupy swing or “most perfect” putting stroke (Johny Millers words), but his dapper threads. Baby blue was the featured color in most of Ror’s shirts this week, which were all made by Oakley. Yes THAT Oakley, not just making sunglasses any more friends. 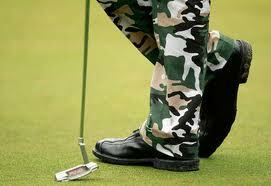 They have a range of golf related apparel items that range from basic to fashionable. And of course they still make shades, and Rory’s all white ones were awesome. His shoes you ask? FJ Sports from FootJoy. A classic look with a little bit of modern comfort, perfect for destroying the field by 8 shots at a major championship. Overall grade: B+. Like the outfits, and the shades, but would have liked to seen more diverse colors, maybe some reds? Oakley, like most other apparel sponsors, script the players outfits for the majors, so he gets a small pass. The other major (HA) news at the US Open was Bubba Watson. Why? Heres Why! Now I get the fact that he was in the Nations Capitol and trying to salute the military, which I’m all for, but…. The belt is awe-inspiring, by an up and coming designer named Travis Mathew. Its a slim cut shirt, and very $$$. But the belts are nice, and the material quite comfortable. Grade:C+ Belt A, pants, D-. Also nice to see Jason Day in his Adidas fashion pieces, and Dustin Johnson didn’t play well, but at least he looked marvelous. The best rules news from Congressional CC was…well no news. The USGA did come under fire from some for the low scoring, but that was more of a weather issue, (which, as an aspiring meteorologist, also happens to be a part time passion of mine.) A hot May+a rainy week+ no wind=low scores. Hopefully the USGA returns to Congressional at some point, but my gut tells me -16 par isn’t what they envision for our National Championship. Ok golf fashion rulers, enough for now. Until next time, I’ll be on the lookout for more hot fashion and rules news. As always, your comments and suggestions are welcome.